Until recently, the hotbed of BC cask-conditioned ale — aka real ale — was Vancouver. As Real Ale has a distinctly British pedigree (as you might glean from having heard of the Campaign for Real Ale), this is somewhat surprising, given Victoria’s British heritage (royal this, that, and the other thing; high tea; double-decker buses, etc.). However, you could only find a cask served at Spinnakers every Friday. Whereas in Vancouver, aside from its three annual cask festivals, a cask is always on at the Irish Heather, is featured every week at Dix and The Whip, and is offered monthly at BigRidge and Taylor’s Crossing. Ironically, a greater number of Vancouver Island brewers were supplying Vancouver with cask ale than their own patrons. 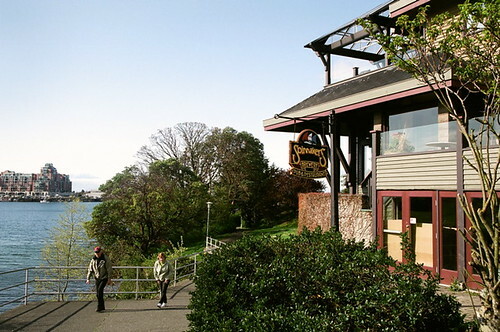 To address this paradox, Spinnakers has aggressively ramped up their real ale production. Now, every weekday, they are tapping a different cask in the taproom at 4:00pm. These are not just cask versions of their regular beer. Brewer Rob Monk is taking advantage of the cask’s small size (40 L) to experiment with different, innovative recipes. For example, tomorrow will feature a Basil IPA, next Tuesday there will be a Maple Nut Brown Ale, and on January 22, it’s a French Oaked Belgian Blonde. Although brewing real ale represents more work for the brewer, it offers them an enticing advantage. When creating esoteric or extreme beers, brewing, say, a 10 hectoliter batch exposes them to much greater financial risk. Most beer drinkers in BC are not that adventurous or even beer savvy, considering how much macro lager is sold here. It would be hard selling so much of an unconventional beer in such a small market (compared to the size of the US). Brewing 40 L, on the other hand, is a completely different proposition. Now the brewer can afford to be creative and may, cask by cask, gradually convert enough of the clientele to be able to brew a full batch of a beer they would not have previously accepted. This is what seems to be happening in Vancouver. The vanguard of brewing in BC is mostly found in its brewpubs (except for Kelowna and Penticton). Typically, they will offer a range of beer styles from lager to stout, Hefeweizen to IPA. Real ale is the next frontier. Hopefully, Spinnakers will now do for Victoria what Dix and R&B have done for Vancouver. A regular supply of real ale is a good thing that every self-respecting pub should have. The further away we get from BC’s beer parlour tradition, the better. One of Vancouver’s best beer tasting events is on tomorrow at Dix BBQ & Brewery. This is an annual event held every December to showcase a variety of strong ales that highlight the seasonality of beer. In the colder weather, you might be inclined to reach for a warming beer, as opposed to a refreshing beer that you would seek in summer. Some of the brewers like to experiment a little, so you often get a one-off beer that you may never ever taste again. Many of the brewers also attend the event, which is a good opportunity to get to know your local brewer. In addition to the full food menu at Dix, there will be a special open-faced turkey sandwich with stuffing and gravy. Some of the offerings at Brewery Creek Liquor Store in Vancouver (Photo © 2008 Rick Green). While I’m a strong proponent of “thinking global and drinking local,” Alan Moen makes an interesting point in the Oct/Nov 2008 issue of Northwest Brewing News: that without access to foreign brews, our own beer suffers. I have to agree. We can see that fact with the emergence of craft brewing in BC in the mid-eighties. If you ask the pioneers why they started brewing, it’s typically because they wanted access to European ales that were unavailable here. Why was Fogg ‘N Suds so popular? Because, suddenly, a whole palette of beer was available when only homogenized macro lager was sold before. Those who had emigrated from, or travelled to, Europe could now satisfy their thirst for flavour. When I returned from a decade’s absence in Hong Kong and San Francisco, I was surprised to see a decline in the availability of imported beer. The venerable Fogg ‘N Suds was closing restaurants and cutting back on their beer offerings. There seemed to be a stagnation in the local brewing scene. Coincidence? Within the last 18 months, however, the import side has picked up due to the efforts of beer importers AFIC Group, Beerthirst, and Bravo Beer in conjunction with private beer & wine stores, such as Brewery Creek, Firefly, and Viti. The arrival of Brooklyn Lager seemed to be a catalyst that sparked a swell in imports, giving us the likes of Anderson Valley, Bear Republic, Binchoise, de Blaugies, Bosteels, Dogfish Head, Dupont, Flying Dog, Gordon Biersch, Green Flash, Hook Norton, Lost Coast, Mill Street, Moylan’s, North Coast, Oud Beersel, Pike, Pyramid, Rogue, and Van Steenberge, to name just a few. In the meantime, the availability and variety of cask ale in Vancouver has been increasing. Dix and The Whip have been offering weekly casks. Now the new Irish Heather offers a cask daily, a first in Vancouver. We’ll see if Victoria catches up as the British brewing tradition is their trademark. We may see Spinnakers start pushing this in 2009. We’ve also seen brewery expansions, either with capacity increases or moves into new facilities. This has been the case for Cannery, Central City, Dead Frog, Fernie, Howe Sound, Mt. Begbie, Phillips, and R & B. Taylor’s Crossing will be adding new capacity to meet the growing demand for the Mark James Group’s Red Truck Ale and Lager until they complete a dedicated production brewery for those two products on Terminal Avenue in Vancouver. Consequently, we are also seeing the emergence of new beers. Howe Sound is exploring an Imperial IPA and and Imperial Stout, both of which were consumer tested at this Great Canadian Beer Festival. Fernie Brewing successfully released a Huckleberry wheat beer as a summer seasonal for the first time this year, while Phillips came out with a blackberry wheat in support of local farmland. Granville Island launched two new Limited Release beers—a Witbier and a Belgian-style blonde ale—and will drop their upcoming Merry Monks Doppelbock and Scotch Ale for two new styles. Yaletown Brewing’s Iain Hill will release an Oud Bruin next month. The hop shortage has also spurred innovation by forcing some brewers to come up with ways to maintain the flavour profile of their recipes or brew styles that use less hops. Taylor’s Crossing, for example, will focus their remaining seasonals on either unique flavours produced from yeast or from different adjuncts. It’s an exciting time for brewers and beer drinkers in B.C. We just need to work on the government to remove some of the Byzantine barriers that prevent us from achieving what Belgium, Oregon, and Washington have.